Tips:The EVA partition in the makeup bag is fixed by glue and there may be some odor in the bag. But the odor will be aerated for 2~3 days after you open it. The odor is non-toxic, please don't worry about it. Note: Cosmetic accessories are not included in this item. High quality PU with reinforced corners for extra durability. 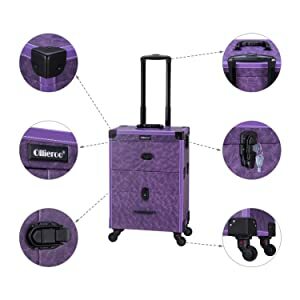 Heat resistant exterior material keeps the case cool and protects your cosmetics. 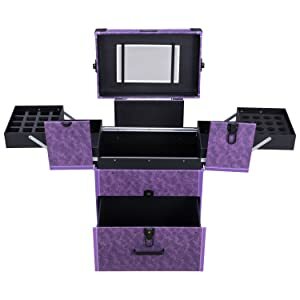 Stylish Design and Lockable Makeup case is ideal for all your makeup items that you don’t want your children to use. 2 Keys for the Top Lids, 2 Keys for Front Door, total of 4 keys which can prevent any unauthorized usage of your items inside. Total four trays, one button tray and one drawer for organized storage. 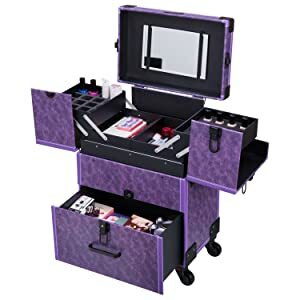 This Makeup Case is portable which you can custom fit your cosmetics to your needs.